43 years old and I haven't exercised since school. Time to shift that belly fat! I’ve never exercised in my life, ever. The last time I engaged in sports activities was at school, and I left there 25 years ago. I suppose I’ve been quite fortunate in that I didn’t ever pile on weight – not really. Well, I woke up on the morning of my 30th birthday with a softening of my belly tissue, but I was still the right weight. Then I discovered ale. Ale isn’t like lager. Ale is wholesome. Ale is like a meal within a drink. Once you’ve got a taste for ale, lager tastes like fizzy water. Ale also rounds out yer belly. I drank it, made it and cherished it. I also married Emma, who is an incredible cook. Emma has a very healthy diet – no meat, no poultry. She also makes brilliant cakes and puddings – as does practically everyone in Emma’s family. While I had almost entirely cut out red meat from my diet, I was also taking in a lot more of the sort of goodies that you see on the Great British Bake Off. Fast forward to the present day and I’m officially overweight. At a height of 169cm and a weight of 75.1kg, I’ve got a BMI of 26.2. That’s too high. It should be below 25. I obviously want to do something about this, but life got in the way. My youngest kids are 3 and 4. I work full time. By the time the kids are in bed, we’re shattered. Those, dear readers, were my excuses. Being far more disciplined than I, Emma had arranged for us to get an exercise bike. Gumtree result! It’s bloody lightweight and foldaway and has Davina McCall’s signature on the side. Despite the fact that Davina has vandalised it, it still runs okay. So, the bike is sitting in the corner of the living room and the novelty has run out. My motivation was non-existent. Then the people at my work did a virtual walk from John O’Groats to Lands End. This sounded brilliant. What if I could cycle a virtual route without leaving the house? 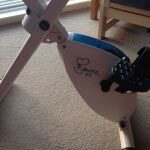 I could exercise on the bike in my living room, keep a note of the distance travelled and input it onto the route. Perfect motivation! The problem with the website they used (worldwalking.org) is that all the routes are pre-set. There’s a good variety but you’re still limited by what they’ve designed. So, I googled & googled and found My Virtual Mission. It’s bloody brilliant. 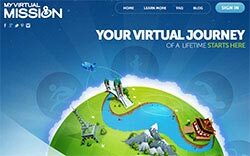 After a simple and free registration process, you can set your ‘virtual missions’. You set your own beginning and end points on a map and you can even work out personal targets on how long you want it to take. For someone who needed motivation, this was perfect. We’ve got a holiday booked next year in Crail. That seemed like a great place to aim to get to. I set the start point as my home and the destination as Crail. 156.9km, which I set out to complete in 46 days. 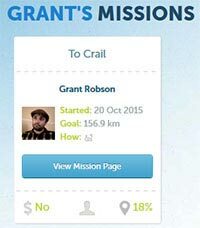 The website allows you to share your progress on Facebook & Twitter and gives you loads of stats on your progress. It’s so easy to use and looks brilliant. At the age of 43, this is the first time I’ve ever found anything that motivates me to exercise regularly. It makes it fun for my geeky mind to have a target to aim towards. I’m going to try my best to keep this up. I’ve already cut out sweets, chocolates and biscuits from my diet and halved my beer intake. Now that I’ve admitted it online and posted my weight, I am further compelled to keep this up. Like I said, I’m new to this. I’d appreciate any hints that you would care to share in the comments. I’ll take them all on board! Looking for the Postman • New Year's Resolutions 2016!